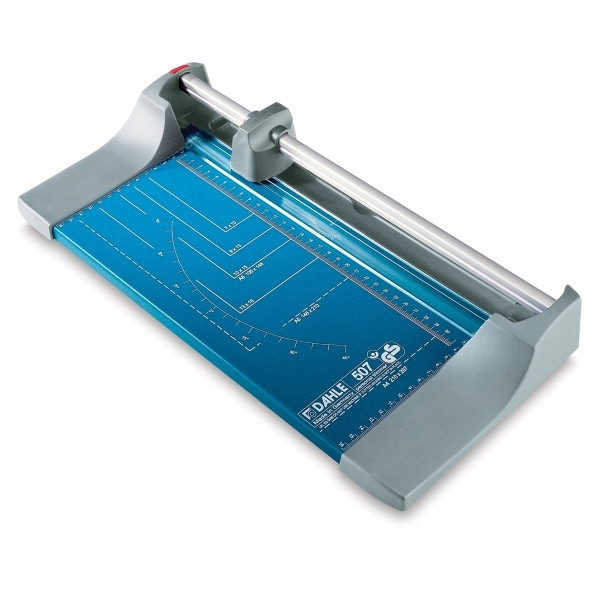 Dahle Personal Rolling Trimmers are perfect for fast, simple, and accurate cutting or trimming of single or stacked paper, photos, or film. Paper is held in position by a see-through plastic clamp. To cut in either direction, just move the plastic housing containing the rotating circular blade. The wheel is ground, self-sharpening, and replaceable. Cutting capacity is 5 sheets. Standard photo-formats are printed on the metal base. Scale bars are graduated in inches and centimeters. Dahle Hobby Rolling Trimmers are perfect for fast, simple, and accurate cutting or trimming of single or stacked paper, photos, or film. Paper is held in position by a see-through plastic clamp. To cut in either direction, just move the plastic housing containing the rotating circular blade. The wheel is ground, self-sharpening, and replaceable. Cutting capacity is 5 sheets.